My cute little girl has the unfortunate plight of having half of my genes, meaning that most likely she won't have any hair until she is two years old. Enter the necessity for headbands and bows. 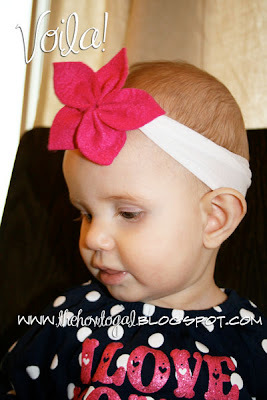 However, it's really hard for me to even think about shelling out $10+ for a baby bow from one of our local boutiques. Solution! 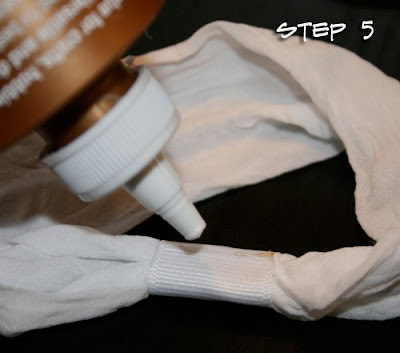 My next door neighbor taught me a fun little way to create an inexpensive headband out of materials around the house and I thought I would share. 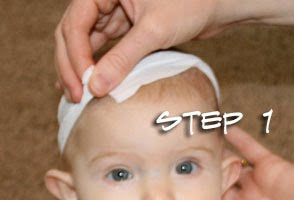 Measure your baby's head with the nylon. Make sure it is fairly snug as the nylon will stretch out over time. Cut to desired length. Hand stitch the two edges together to form the band. 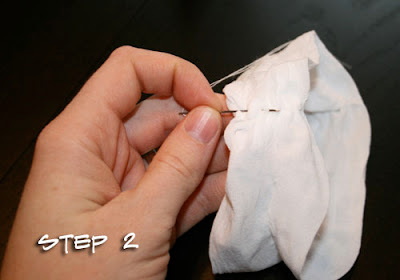 Cut a piece of ribbon to cover and secure your seam. 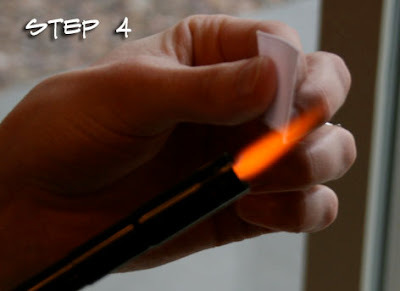 Seal the edges of your ribbon to prevent fraying with your lighter. 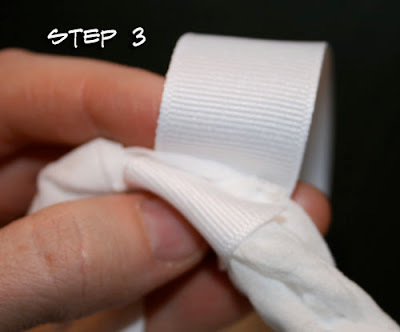 Wrap your ribbon around the seam and glue edges together. Your band is complete! What I love most about this project is the flexibility and variety of bands you can make. Be creative! 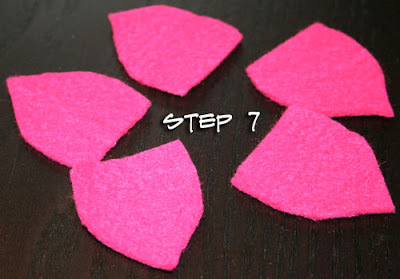 Cut a petal pattern out of regular paper, pin to your felt and cut out. If you would prefer your petals to be round, make your pattern piece have a round end instead of pointy like mine. 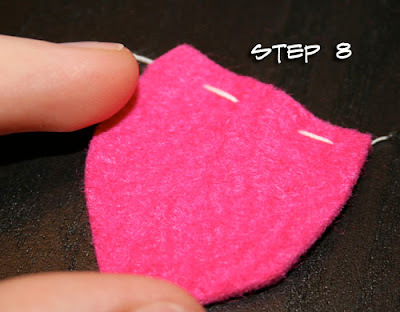 Layout your petals to get the approximate size of the flower. I used five petals for my flower, but you could use more or less depending on what you want yours to look like. 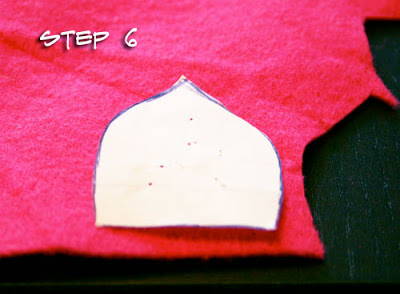 Make two tiny stitches across the top of the petal. Start connecting your petals by going in and out through each one. Once all of your petals are connected. 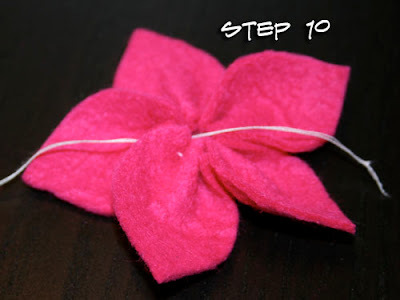 Pull both ends of the thread to bring the petals into a flower shape. To secure, tie the two ends together and knot. Option one: Glue your flower directly to the band. Option two: Glue your flower onto a hair clip and slip into the ribbon portion of your band. This option allows you to use the same band over and over with other flowers. Isn't she so cute! Now she has a few different bands; black, white, cream, and gray that I can attach different flowers to. Sooooo cute! I saw this headband on your dearchicka and thought it was darling. Now that I know you made it... it is even more amazingly cute! This is great! I have a 3 month old who will need something spiffy when it's warm enough to put the hats away. BTW the new look is fun. Love this (I too have a baldy girl - you can see my hilarious "solution" in my latest post). 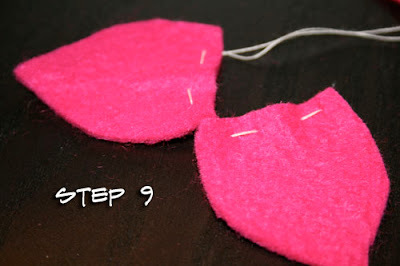 Will have to try this & borrow your flower design idea to embellish some clothes too. Thanks! I may set it on fire trying the lighter bit though....will have to reread your directions. I am going to have to try this! I have 3 little guys and then had a baby girl, so all of the bow/flowers are pretty new to me! :) You make it look very easy to do...my speed!
. it is even more amazingly cute!